Running for its third year, the Experience Creative Woodstock project is a collaboration between five of Cape Town’s top creative colleges. 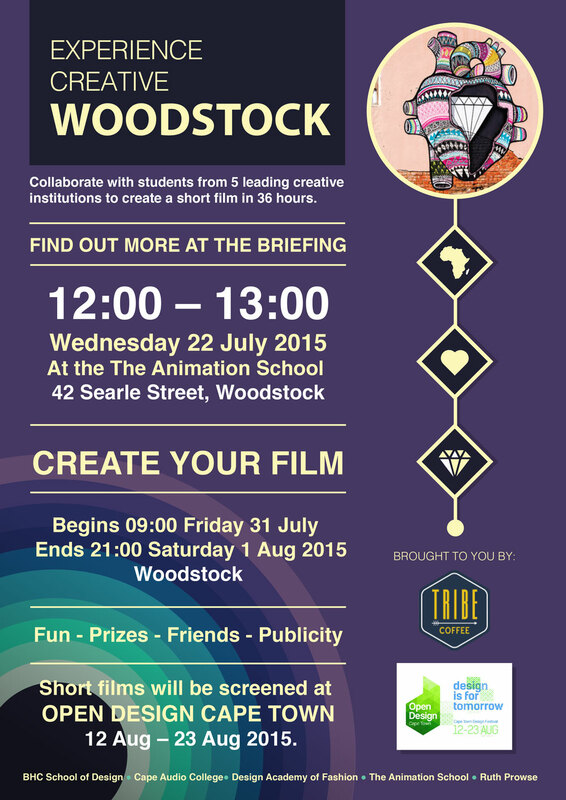 Students have 36 hours to write, film, edit and render a short film on the topic of “what makes Woodstock the creative hub of Cape Town”. Students from each collage are divided into five teams that have to work together to create a 5min short film for the hectic 36 hour deadline. The concept is to capture the essence of Woodstock and how Woodstock has been developing as the creative hub of Cape Town. The briefing was held this week at The Animation School and the entire project kicks off at 9am on the 31 July and the deadline is 9pm the next day. The students are given zero budget and must organise their pre-production on their own. This is a great opportunity to meet other students involved in different disciplines and build up connections for future projects within the creative industry. A professional screening completes the project, which will be a cocktail party held at Bello Studios in The Old Biscuit Mill, Woodstock. This event will be held on the 8 August 2015 and is free and open to the public. Dan Mace (aka Dan The Director) will be there to talk about his career and share some inspiration with the students. More details to be confirmed soon. The short films will also be screened at Open Design Cape Town, which runs from the 12 August – 23 August 2015.